Well folks, last week at Partner Exchange 2011 marked the final sessions of the VCDX3 version of the defenses. We now move onto VCDX4 in 2011 for those of you who are looking into this highest level of VMware certification I wanted to provide a little input. First off I was amazed in a vCloud design workshop when asked who was planning on taking the certification how many hands went up. What made it surprising is we also conducted two VCDX preparation workshops last Monday and the attendance was not even close to the number of people who “planned” on going through the process. This got me thinking that people out there assume the defense is an easy thing to get through, otherwise why would so many people not come to the prep workshops? It sounds like a silly question, but really why were more people not in the prep classes then? So here is my advise to those that are planning on taking the defense for VCDX4. Review the workshop materials that are posted on the VCDX site along with the new materials and FAQ’s as they get posted. The information is very useful. Read Duncan Epping’s post about using the template materials. These are yours to use but show some creativity. If you think you can make a 2 host design interesting enough to talk about for 75 minutes……go for it but think before you decide to go that route, because trust me when I tell you……it’s not going to be fun to talk about for that long. When it comes to the live scenarios during the defense simply remember this; Treat it like a last minute customer meeting that you got pulled into without any notice. You have to think on your feet and move yourself forward through the process. If you are doing a fictitious design, try to use your peers to play the customer. Get them to set forth some real constraints, assumptions, and requirements. Let someone else feed you these items so you can then come up with a design that fits those and present it back to them. I know if I tried to do something completely fictitious on my own I would have trouble coming up with requirements, constraints, and assumptions, that “felt” real enough to work up a design from. Establish a peer program to facilitate the review process internally and prep each other. Peer reviews can in some case be no different than the defense itself. Justify the design submission to your colleagues either before or after the acceptance of the design. This is something you should workshop yourselves to help candidates prepare for the defense. Ask each other questions about the design, remember the design should be as good in quality as you would give to a real customer. Another point to make is your design does NOT have to be free of mistakes. Mine was not in my defense, but you have to understand the flaws in your design and properly address them to the panel members. Really the point is nothing is perfect. People like to think their work is perfect but nobody’s is, and no DESIGN is perfect. They all may have one flaw or another. Make sure you focus on the core infrastructure. You will see this in the prep slide decks as well on the VCDX website. Although you can submit a design on View, SRM, or even vCloud for that matter, the focus of the program is to evaluate the foundational design of the core products. Nothing can survive without vSphere underneath it which is why the focus is generally on the core foundation design. No building can survive without a good foundation before you start building the other floors, and neither can other VMware products. They all need a solid vSphere foundation under them first. Lastly, next time we are holding a VCDX prep workshop, if you are planning to defend……SIGN UP FOR THE CLASS. I’m confident you will pick up other tips to help you prepare. Don’t just assume it will be an easy process to complete. These are usually held at VMware events so keep your eye out the next time and if you see one, sign up. It is your chance to ask questions of real live talking VCDX Panelists since usually we conduct the class. At the end of the day remember that it is about justification as well as tying your requirements, constraints, and assumptions to the design. I cannot count how many times I have seen VCDX applications where the design decision was “To use DRS or not to use DRS”. Although this is a valid question let’s be realistic…..give me a darn good reason why you would not and make that a constraint of the design which would be an interesting talking point. However if it is just because it is a best practice, then that is not very interesting. A better example may be a constraint by the customer that their CMDB requires the application/VM be tied to a Hostname not a cluster therefore DRS needs to be disabled. THAT is a good example of a constraint adding a requirement to the DRS design because it directly affects DRS OR having DRS in fully automated and the type of real considerations an Architect needs to address. That also affects the operational procedures for host downtime and maintenance procedures. Nothing I have stated here is a magic formula to pass the defense which I think is what some people are looking for. Much of this to me is common sense, and really is stuff every good Architect should know. I have not revealed anything hidden or violated the “Magician’s Code” in any way, and there is no “Holy Grail” of how to pass. This is really about being yourself and allowing the panel to see what you know about VMware architecture. Below is the table that outlines the process from the VMware website which I am sure many people have seen. I wanted to add this mainly for those that did pass the previous VCDX3 exams but never made it to a defense. 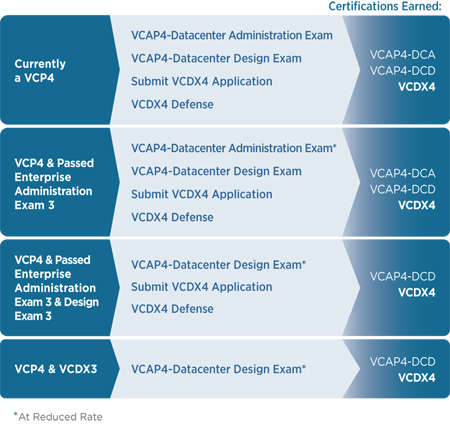 You still have to take and pass the VCAP-DCD exam to be considered for defending VCDX4 in front of a panel. This was a common question we got last week during the prep workshops. 1) Don’t stress. I’m quite sure VMware would not accept an application and schedule a defense for a candidate who does not have a mathematical chance in passing. 2) You’ve identified the design mistake. Be aware of it in the defense but I wouldn’t call attention to it as a first order of business. Defense time is valuable. I wouldn’t waste it unnecessarily explaining a fix which may not net any defense points. Let the panelists discover the mistake and then respond accordingly with a correction. Really the point is nothing is perfect. People try to think their work is perfect but nobody’s is, and no DESIGN is perfect. They all may have one flaw or another. The bottom like is if it meets the requirements, constraints, and assumptions set forth by the customer, then the design is usually pretty good. Chris, the recommendation to set up a peer review process is an excellent suggestion, but one that I find many candidates failing to do. They’ll ask me for suggestions, for any tips, and I’ll tell them, “Do a mock defense. Get your peers to review your defense, rip it to shreds, and then grill you about it.” Yet so many times, after all is said and done, they fail to take the time to perform this crucial step. I have to agree that it seems as if many people are underestimating the magnitude of the defense. Excellent post. I think candidates often fail to realize both the time and financial commitment (either personal or from their company) involved with the defense. As Scott writes, it really needs to be treated it as something that requires preparation. I think there is enough information available now outlining the defense process that can be used to develop a realistic ‘mock defense’ environment, especially if you’ve got peers who are planning to go through the process. Other similar processes (PhD, CISSP, others?) sometimes involve a mentor or ‘buddy’ to nudge candidates in the right direction. It makes me happy that the VCDX group has stepped up, albeit unofficially, to fulfill this role by means of posts like yours, Duncan’s, John’s, and others. Thanks Doug! I hope these tips help folks make it through their VCDX4 defenses this year.